Description of an unusual case of a spontaneous Uncomplicated hyphema and fibrinous uveitis secondary to immune thrombocytopenia is presented. The literature is reviewed with particular reference to the etiology of spontaneous hyphema and relation of fibrinous uveitis with the fibrin degradation product. Immune thrombocytopenia (ITP) is a heterogeneous syndrome of unknown etiology characterized by a reduction in the platelet count, normal or increased number of bone marrow megakaryocytes, and a shortened platelet life span. The mechanism is presumed to be either antiplatelet antibodies or immune-complex mediated destruction by reticuloendothelial cells. The patient, a 59-year-old man, a banker by profession presented with a 3-day history of a red, painful right eye, and diminished visual acuity OD. There was no history of trauma. History of epistaxis and malena was also present. His visual acuity was recorded as 6/9 right and 6/6 left. Intraocular pressure was recorded to be 12 and 15 mm by noncontact tonometer. Detailed slit-lamp examination revealed hyphema with fibrinous anterior uveitis in the right eye [Figure 1]. Fundus examination was unremarkable in the left eye and dilated indirect ophthalmoscopy also revealed no abnormality in the left eye patient was prescribed gatiquin-prednisolone drops 6 times a day along with homatropine 3 times a day. Hyphema resolved in a period of 4 days while fibrinous uveitis resolved over a period of 7 days. Investigations revealed a leukocyte count of 7000 and a platelet count 85000. The white cell differential count was normal. His antinuclear factor was positive and the DNA binding 35 units/ml (normal = 1–25). Fibrin degradation product (FDP) was increased (>5 < 20). A provisional diagnosis of immune thrombocytopenia (ITP) was made. While the hyphema could be related to ITP, in the absence of any other cause for uveitis, increased levels of FDP could be related to fibrinous uveitis. Uveal deposition of immune complexes causes secondary platelet damage and intravascular coagulation which results in uveal tissue damage through inflammation. Normal cellularity with an increased number of megakaryocytes was found in bone marrow aspirate, consistent with peripheral destruction or sequestration of platelets. Blood coagulation tests gave normal results and there was no splenomegaly. Although indirect immunofluorescence tests were negative for platelet antibodies, these findings were compatible with a diagnosis of ITP. Ocular trauma is usually associated with anterior segment hemorrhage. Retinoblastoma, juvenile xanthogranuloma, abnormal anterior chamber vessels associated with iris melanoma or rubeosis secondary to diabetes mellitus or Fuchs's uveitis syndrome can cause spontaneous hemorrhage.,, Persistent primary vitreous Fibrovascular membranes of retrolental fibroplasia, retinoschisis can also bleed into the anterior chamber leading to spontaneous hyphema. Hemorrhage from iris neovascular tufts near the pupillary frill was first reported in 1973. Anterior uveitis associated with herpes zoster, diabetes mellitus, and Beqet's syndrome can also cause hyphema. A total of 16 cases of spontaneous hypema and corneal hemorrhage as a complication of microbial keratitis were reported by Ormerod and Egan in 1987. Blood dyscrasias, notably leukemia, hemophilia, sickle cell anomalies, and malignant lymphoma also present as spontaneous hypema. A case of spontaneous hyphema secondary to ingestion of aspirin and alcohol, related presumably to a reduction in platelet function has been reported by Kageler et al. Spontaneous hyphema is relatively uncommon. ITP should be kept as a differential diagnosis of spontaneous hyphema particularly when history of epistaxis and malena are present. The role of FDP in fibrinous uveitis needs to be correlated. Frazer DJ, Font RL. Ocular inflamation and haemorrhage as initial manifestations of uveal malignant melanoma. Incidence and prognosis. Arch Ophthalmol 1979;97:1311-4. Howard GM. Spontaneous hyphema in infancy and childhood. Arch Ophthalmol 1962;68:615-21. Liesegang TJ. Clinical features and prognosis in fuchs useitissyndrome. Arch Oplithalmol 1982;100:1622-6. Maguran D. Unilateral spontaneous hyphaema. Br JOphthalmol 1973;57:945-7. Doggart JH. Spontaneous hyphaema. In: Acta XVI Concililum Opthalmologicum Brittania. Vol. 1. London: British Medical Association; 1951. p. 450. Ormerod LD, Egan KM. 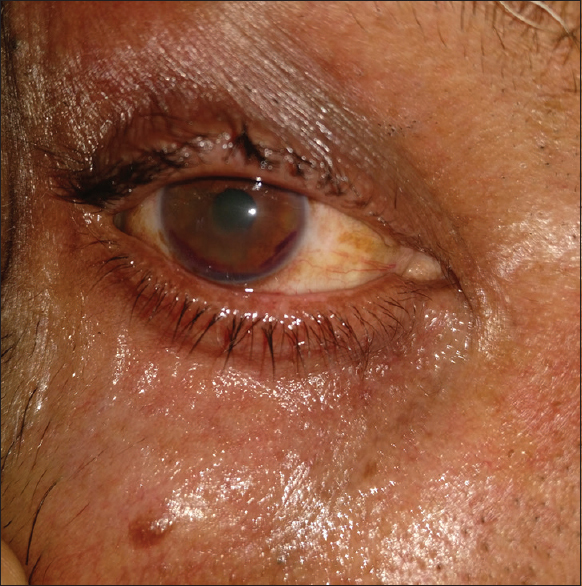 Spontaneous hyphaema and cornealhaemorrhage as complications of microbial keratitis. Br JOphthalnmol 1987;71:933-7. Massa JM, De Vloo N, Jamotton L. The ocular manifestations of Hematologic Diseases. Bdll Soc Beqge Oplitalnmol 1966; 142: 415-34. Kageler WV, Moake JL, Garcia CA. Spontaneous hyphemaassociated with ingestion of aspirin and ethanol. Am J Ophthalmol 1976;82:631-4.